Fast & Healthy Alternative To Frying: The Microwave Potato Chip Maker crisps potatoes to a healthy crunch in under 10 minutes. It is the perfect kitchen accessory for potato chip lovers, vegetarians and vegans. No need for oil, salt or any other additive. Cooks All Kinds Of Chips: This versatile accessory can also be used to make apple chips, bagel chips, pumpkin chips, carrot chips, sweet potato chips, etc. It is great for making healthy snacks for movie night and for those who like to make food from scratch. Easy To Use For Low-Cost, Home-Made Chips: Slice potato or vegetables in thin slices, leaving the skins for added nutrition if you prefer, and place upright in the slots. It takes just minutes in the microwave and you will have your own fresh, crispy, sodium and chemical free potato chips! Food Safe & Bpa Free: Made from BPA free polypropylene, the Microwave Potato Chip Maker is food-safe. Features slots for up to 36 slices. The maximum thickness of slices is 3 mm. For crispy potato chips, slices should not exceed 2 mm. Also available for: pumpkin chips, carrot chips, sweet potato chips, apple chips, carrot chips, etc. 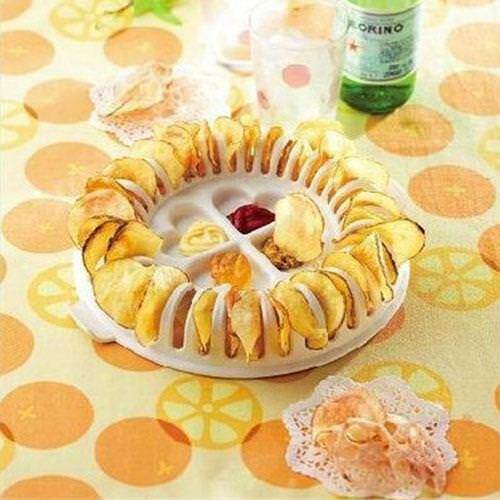 1 X LOW FAT POTATO CHIPS MAKER.